To some, it may seem like just another event on a billboard in the busy, industrial city of Monterrey, Mexico. But for the group of pastors and leaders who have gathered early each week to pray downtown, the Festival of Hope with Franklin Graham is about more than a few hours of entertainment. 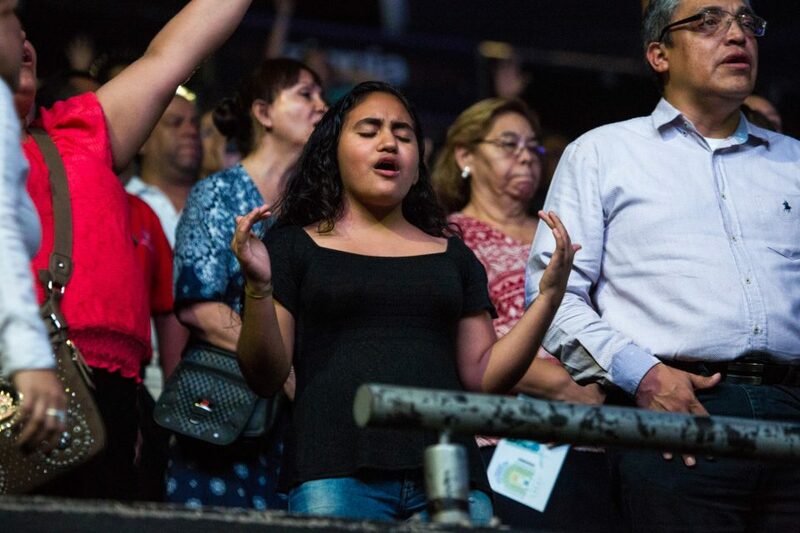 Thousands have been preparing for the Gospel to be shared at the Festival of Hope (Festival de Esperanza), happening this weekend at Arena Monterrey. From an ongoing, 24-hour prayer chain to training 18,000 followers of Christ who are reaching out to and praying for their community, there’s been a widespread call for revival in the city. Thousands filled the bleachers at Arena Monterrey Friday night for a dedication and prayer service ahead of the Festival. Together, the enthusiastic crowd prayed for each seat in the arena. With over 500 churches committed to pray and spread the word to more than 50,000 neighbors, many have high hopes for the Festival and the future of Monterrey—including Festival Director Galo Vasquez. His specific hope for the city is “to be able to build bridges into the different areas of society” and for more open doors to the Gospel. Recognizing the degree of violence in the area, Vasquez has noticed a constant fear among people in Monterrey. Still, he says people seem to be in a “comfortable” state of mind and uninterested in religion. 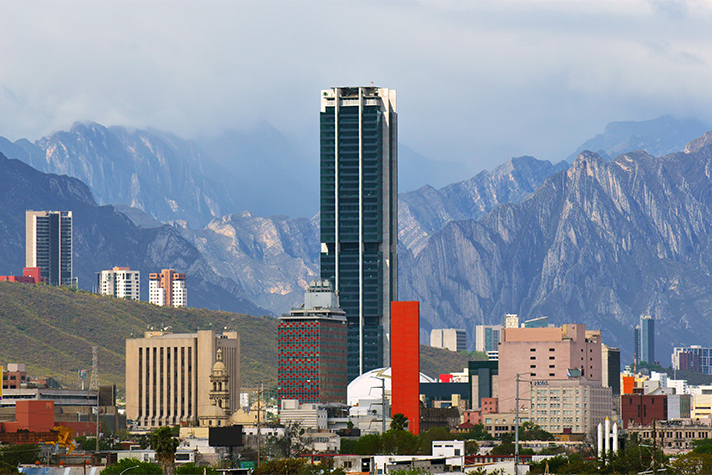 Monterrey is the capital of the Mexican state of Nuevo Leon. The industrial city is surrounded by mountains. Yet, he’s hopeful many will be open to hearing Franklin Graham’s message at the Festival. “As we bring the news of the Gospel, we believe people are open to new ways of thinking about their lives, future and eternal things. In that context, there’s a lot of freedom for our message,” Vasquez said. This timeless, Gospel message is the same one Billy Graham preached in the country back in the 1980s, and Franklin Graham shared at his last Festival in Mexico a decade ago. >> Listen to Billy Graham’s sermon in Mexico from 1981. And as Franklin Graham returns again to give the Good News, prayer has paved the way for an awakening. Pray that people would boldly invite family and friends to the event, and that people would have open hearts to accept those invitations and come. Pray for final details and preparations leading up to the Festival. Pray for the safety and protection of all. Pray the issues many are facing in Monterrey will diminish. Pray for local believers and volunteers—that they will remain excited about their role in evangelism ahead of, during and following the event. 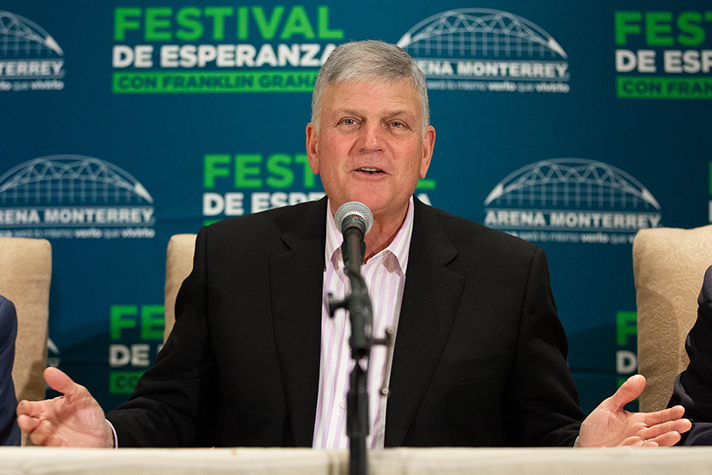 Pray for Franklin Graham as he prepares to share the Gospel three nights in Monterrey.